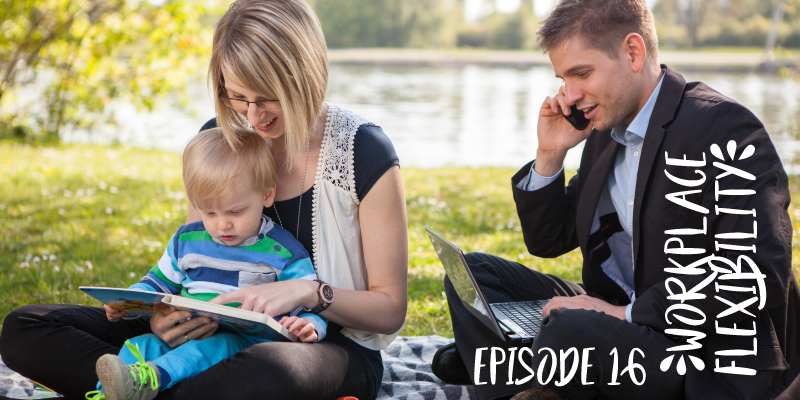 In this episode, I want to take a bit of a deeper look at one of the things that I think is really key for working families, and that is workplace flexibility. There are several fronts where flexible work can make working parents lives easier. On a day to day level it can help parents work around school or pre-school operating hours, or work at a time of day that fits in with family responsibilities and allows for better productivity, allows for out of the ordinary appointments or events to be taken care of without a major hassle and also just make the dual responsibilities of work and family co-exist more harmoniously. Stepping back and taking a broader view, it can help parents of school-aged children work around the many many weeks of school holidays, help parents to feel less overloaded with responsibilities and allow parents to take a more active role in things like their children’s sports team or activities. More and more often I am seeing workplaces offer flexible work arrangements, and increasingly in job adverts, I am seeing flexibility listed as an attribute of the workplace and an option that will be available to the successful applicant. This is great to see and to very honest the more I see this the more chance I have of finding a job that I can give my best to! But what we don’t want to fall into is the trap of seeing flexible work as doing less, working less or achieving less. Overwhelmingly when people talk about flexibility at work, it is their work being assessed as a ‘number of hours at work’, When we focus on that aspect, it encourages a correlation between the number of hours worked and how ‘good’ an employee is. The more hours worked the more valuable the employee. Just think of the scenario of the last one to leave the office being praised by management, and the person leaving in time to do the school pickup being seen as ‘slacking off’ or ‘taking advantage’. This metric (which is known as presenteeism) means that when an employee arranges their days and weeks so they can get to school pick up or go to children’s appointments or events, they are seen as achieving less, being less committed and therefore less valuable to the workplace. 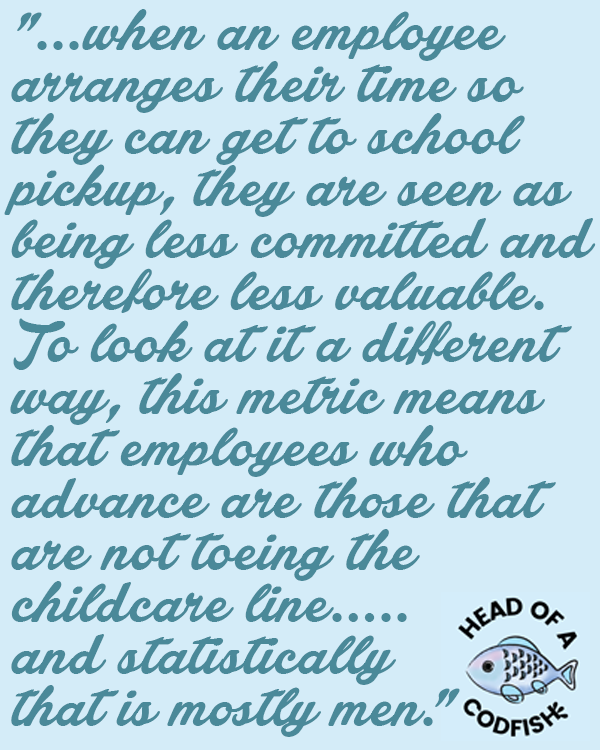 To look at it a different way, this metric means that employees who are seen as more valuable and are more likely to advance are going to be those that are not toeing the childcare line…..and statistically, we know that currently that is mostly men. But a different metric to assess value is how productive we are, what we are achieving in our work and how effective we are in the time we do work. Research is showing that employees (both men and women) that are at work fewer hours have a greater sense of balance in their lives and a greater ability to look after all their life responsibilities. As a result, they are more content, more productive at work and easier to retain in the workplace. Some suggest that in reality, people working 4 days get more done than those working 5 days, that fewer hours leads to higher efficiency and productivity within those hours as opposed to long passages of time that are easily wasted. We all need to challenge our perception of flexible work as ‘working less’ and think of it more as ‘a better fit for the same work’. We need to view those working full-time hours but in a more flexible way as having the same value as those who work 9-5 in the office. Instead of part-time work being seen as a less productive ‘cop out’ option, it is time to get acquainted with the idea of the ‘power part-timer’ – a highly productive person who is sharply focused on their work and get’s in, gets the job done and gets out – the model of ultimate efficiency. 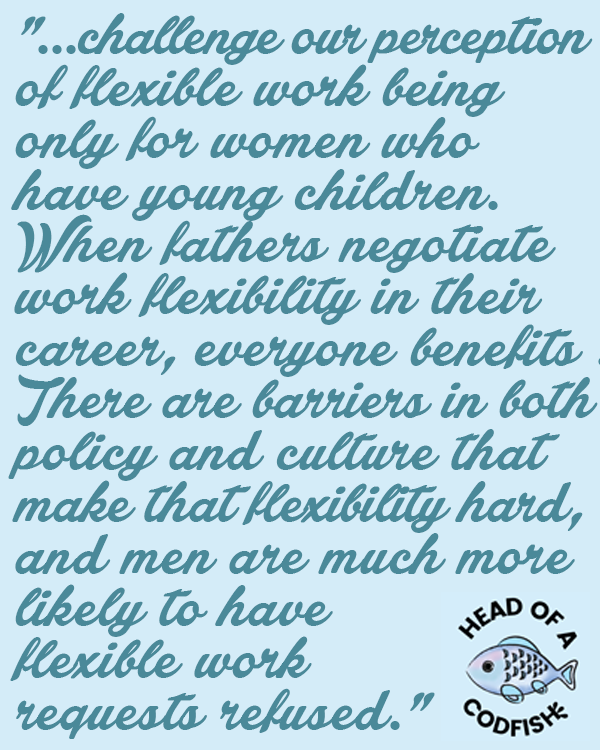 We also need to challenge our perception of flexible work being only for women who have young children. When fathers negotiate work flexibility in their career, everyone benefits, their partners, their children and of course themselves. Currently, there are barriers in both policy and culture that make that flexibility hard, and men are much more likely to have flexible work requests refused, so there is still a lot to achieve in this area. Other people who can benefit from flexible work arrangements are those that are looking after elderly parents, people who have sporting commitments and who would like to work around training and events, and those who take up voluntary roles in areas such as country firefighting or first aid provision. All of these things can happen more easily, and a person’s value to the community can be broader than purely paid work when they can access flexible work arrangements. Probably what springs to mind straight away is part-time work, which can be either working fewer days than the normal amount in your industry (which could be 5, 6 or 7 days) or working shorter hours on the days that you do work. This is a popular option for people with young children as it allows for a full days work while children are at long day care, and other days of the week can be devoted entirely to the care of those children. Then when it comes time for those children to go to school, it may be a better fit to work shorter hours each day and work 5 days a week. I think an important thing to note about part-time work is that it is not limited to only one member of the family. It can be taken up by either parent or both. In Episode 3 Rachel talked about being in a family with 2 parents working part-time. Compressed hours is slightly different to part-time work in that instead of working a reduced number of hours (and pay being adjusted to reflect those reduced hours), an employee working compressed hours will still have a full-time load but those hours are compressed to take up a smaller part of the day. So, for example, some one might start earlier, take shorter breaks throughout the day and finish earlier which may allow them to get to school pick up. This can either be done on every day of the working week or applied to some days while other days are a more standard 9-5 work day. Another similar idea is compressed weeks where someone may work longer hours on each of the days that they are at work, but work fewer days in the week. For example, they may work 4 days a week for 10 hours each day. Job sharing is where you have 2 employees who together complete the work of 1 full-time role. The working days can be divided evenly or with one person having more hours than the other, and the 2 employees may or may not have some period of time overlapping. I think when in an office setting the job share employees are likely to have some period of overlap, but in the education sector, there is less likely to be an overlap of teachers in the classroom. So job sharing is obviously quite dependent on the work dynamic of the 2 employees, but the advantage is that a full-time workload can be achieved with each person working fewer hours. The availability of working remotely or as it is sometimes known ‘working from home’ can vary greatly from industry to industry. There are obviously many industries where this type of work is just not suitable. From my perspective, there are a couple different types of remote work. There is working remotely on an ongoing arrangement where all or some of your work time is completed remotely. The other way is to have the option to work from home as the need arises, for example, if you have a sick child, or to be home to allow someone access to your home during work hours, or for personal appointments during the day where commuting to and from work makes it time prohibitive. So with flexible hours, we have the ability to start and finish a work day earlier or later while still completing the required workload. In a workplace where you have flexible hours, you often have the concept of core hours. On any given day you could start earlier and finish earlier but you would need to be on-site within specific core hours. This could be 10am to 3pm, and generally, any mandatory or required activities are held within those core hours so everyone is in attendance. Again this is good for working around school hours and I can imagine it being really effective if you have 2 working parents able to access flexible hours so they can split pickups and dropoffs. I have put shorter work hours in this list as a separate item to part-time work. Part-time hours would be where a workplace is operating for a full day and some employees choose to work less than a full-time workload. Shorter work hours is when all or some of a workplace is operational for a shorter part of the day. This isn’t really a common option but there are some workplaces who are beginning to experiment with either a 5 or 6-hour workday. It can either be arranged so that everyone is doing their 5-6 hours at the same time, so in the morning and then leaving earlier, or that those 5-6 hours can be completed anytime within a full workday. Purchased leave is where an employee can purchase annual leave in addition to their standard allocation, and their salary throughout the year to adjust to account for that purchase. For example you may get 4 weeks annual leave per year and then have the option to purchase an additional 4 weeks. Now as you can imagine this is a handy one for working around school when the amount of school holidays outweighs the amount of leave you have. So that is my rundown of the common types of flexible work. Obviously, each workplace is different and when we look at individual workplaces some options are more suitable than others. But I would put money on the fact that most workplaces could offer more of these than they currently do! And of course, a solution that is the most productive for an individual may be a combination or more than one option. For example, I used to work a day that ended in time do school pick up, and it was a combination and part-time and compressed hours in that I was paid for fewer hours, but I also had a shorter lunch break on that day to maximise the amount of work I could do on that day. So that is my look into work flexibility, let me know if there are any other options you think should be included.